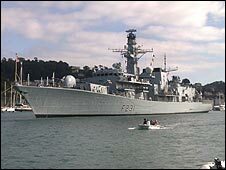 The Royal Navy warship HMS Argyll is to have her missile system upgraded in a major £19m refit in Fife. The Type 23 frigate has just arrived in Rosyth for a year-long overhaul by 120 Babcock staff who will provide her with new electronic guns. It will also get a new weapon control system, a new computer system, upgraded living quarters, and a sonar upgrade. The updated Sea Wolf missile system is similar to that used on the Navy's new Type 45 destroyers. It will boost the power and accuracy of the weapons and is designed to sustain the capability of the Type 23 frigates even as technology moves forward. Commodore Brian Archibald, MoD head of surface combatants, said the updated Sea Wolf weapons system could counter a target travelling at twice the speed of sound from over 20 miles away. He said: "We are rolling this update out across the frigate fleet in response to the increasing threat of faster, lower flying missiles. "The update is so advanced it will even guard against future missile developments. "In addition to war fighting roles the ship can conduct a wide range of tasks including anti-piracy and anti-smuggling activities, disaster relief work and surveillance operations, particularly in the northern Arabian Gulf." Scottish Secretary Jim Murphy, who was in Fife on Friday, said: "It's great to see a resurgence in the ship yards thanks largely to a number of defence contracts over the past decade. "Companies in Fife such as Babcock work hard to win these contracts and ensure staff have the skills and expertise to deliver challenging and important government projects." Mike Pettigrew, managing director of Babcock at Rosyth said: "The award of this contract continues to allow us to develop the high level of skill sets required to support the Royal Navy, and further strengthens our partnering relationships with the MoD through the Surface Ship Support Alliance."